Notes From the Playground: Magic Theater. For Madmen Only. Magic Theater. For Madmen Only. I first read Hermann Hesse the year I turned 25. I was in grad school at the time and in the middle of exploring literature and the great writers and his name was on the list. At the time I'm pretty sure that his book Steppenwolf (yes, it's where the band and the Jack Kirby character got their name), was the only work of his I had heard of. If memory serves I found a used paperback copy of it one day while shopping for comics at Books Galore in Erie. I had no idea that this was going to be one of the seminal books of my life. I read somewhere that later in his life Hesse expressed surprise that Steppenwolf had found an audience among young people. He had written it when he himself was nearing 50, and the protagonist of the novel, Harry Haller, is the same age. 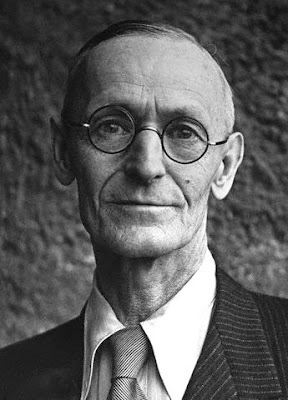 Hesse believed he was addressing the concerns on middle age, yet the book's primary popularity was among the college-age reader. All I know is at the time Steppenwolf seemed to speak to everything I was going through in my life. I remember thinking that here was an author who had found the words to my soul and he had done it years before I had been born. Yes, I know how young and overly dramatic and poetic that may sound. But, one of the things I love about Hesse's writing is that throughout his life his voice remained young and overly dramatic and poetic. He was unburdened by the post-modern, morbidly self-aware fear of seeming sentimental (since when should genuine sentiment be considered a bad thing?). It's difficult to remember just what it was that struck me so strongly. I certainly wasn't a depressed middle-age man who was contemplating suicide. I wasn't old enough to feel like I had missed out on life. But there was something. Part of it was the duality of personality he talked about (and this isn't a book review, so I'm not going into the plot here... read it). I have always struggled to balance the extroverted and introverted parts of myself. I was yearning for the life of the artist, the life of the soul, and at times feeling bogged down with the reality of this world. It is the tension between the sacred and the profane that is at the heart of the novel. I still feel that at times, though not as profoundly as Harry Haller. I think any creative person in a life-long relationship with their muse feels this. This started me on a Hesse kick and I read pretty much everything by him I could get my hands on. My bookshelves still hold a large Hesse collection, including a first edition of a poetry collection called Hours In The Garden, a birthday gift from A_. I devoured his work. Though I read them out of order I was able to see the progression of his thought and the development of the themes that ran throughout. His way of looking at the world informed my own and I spent a lot of time trying to write like him before I realized I needed to find my own voice. The year I turned 40 I reread Steppenwolf and once again it seemed to speak to everything I was going through in my life. How could that be? I was fifteen years older, no longer a callow youth, and certainly still not a depressed, suicidal middle-age man. That was the year I signed the contract to have my first novel published, so I was at least on my way to finding my own voice (and my novel really doesn't resemble a Hesse novel at all). I resolved then to put it back on the shelf and read again the year I turned 50. I just finished rereading it. For the first time I came to this book at the age of the protagonist. I also came to it with a different perspective than either of the last two times. I had expectations this time. Did it speak to everything going on in my life? Yes, but not in the same way. I read it this time looking for the ways it would resonate. More than speaking to me now I was aware of how many of the ideas have simply become a part of my life. Thanks to Harry Haller's struggles I didn't have to go through the same thing. Though inarguably middle-aged, I'm still not a depressed, suicidal man who feels like he has missed out on life. Steppenwolf served as a cautionary tale. I learned early not miss opportunities that arose. Unlike Haller I learned to dance, and to enjoy music and the joys of the sensual world. The sacred and the profane both exist, hand in hand, and they are both a part of my life and each would probably be unrecognizable without the other. There were certainly still lessons to be learned. I was more aware of Hesse's political commentary this time around, and how it reflected my own current thoughts on the topic. It's a subject I can get easily mired in, much to my emotional detriment. There are ideas in the novel I need to think through to help me be more at peace with these issues. This was certainly true of the world when Hesse wrote it. He says in the novel that Nietzsche suffered what everyone was suffering, only a generation earlier. This was written in the early days of radio, and worldwide communication was just starting to be taken for granted. We now live in a time when not only two ages, cultures and religions overlap, but when all cultures and religions overlap in ways they never have before. In the Information Age time has sped up. Changes in technology have both united the world and separated us in unprecedented ways. Does this, in Hesse's words, reduce us to real suffering, to hell? Does the world suffer more now than ever before, or are we simply more informed about it? Are there more Harry Hallers out there now, living the famed life of quiet desperation than ever before? I don't know. If so, there are lessons in Hesse that can help. I am still enamored of Hesse, and amazed that I can still find gold in his work. This is alchemy as it's meant to be understood. It's the transformation of lead (base material, the profane) into gold (spiritual material, the sacred). Maybe I'll read it again when I turn 75. And on rereading this this morning I don't feel like I did my feelings justice (that's why I put that opening quote there in the first place). As much as I think I've learned to live in the moment and surrender there are still times, surrounded by friends and people and music that I feel like the outside observer, not fit for company. There are times I would still rather stay at home with my books and papers than be with people. For the most part, I achieve the balance, but not always. The book points beyond this duality as well, and I think I get that. There are always more sides than either/or.